BELLEFONTE, Pa. -- A judge is hearing evidence of worried texts from Penn State fraternity brothers as he considers whether there's enough evidence to send charges related to a pledge's death to county court for trial. Testimony resumed Monday in a preliminary hearing for the Beta Theta Pi chapter and 16 of its members, accused in the February death of 19-year-old pledge Timothy Piazza. 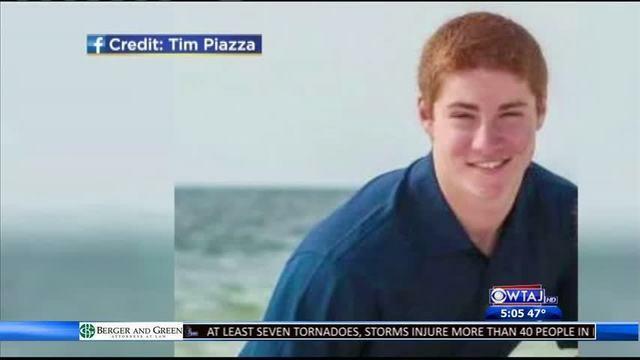 Piazza drank heavily as part of a hazing event and then was fatally injured in a series of falls. Prosecutors introduced a text from the house pledge master that said "it's over" and that he didn't "want to go to jail" for it. Another text between fraternity brothers, as Piazza was near death in a hospital, says, "he drank because we hazed him." Authorities say Piazza, of Lebanon, New Jersey, suffered severe head and abdominal injuries before he died. Help wasn't summoned until the next morning. The hearing in Bellefonte, Pennsylvania, resumed Monday, following a 10-hour proceeding last month, when a detective was the lone witness. It's expected to last at least until Tuesday. "He looked dead, he looked like a corpse," said State College Police Detective David Scicchitano testified last month, describing Piazza's appearance in video footage showing frat brothers carrying him upstairs the morning after the pledge event. Played in court last month, the video showed fraternity members carrying Piazza's limp body upstairs, smacking him in the face, and pouring liquid on him as he goes in and out of consciousness for hours. Returning to the witness stand Monday, Scicchitano testified one frat member told police he and another said aloud after Piazza's first fall that they should call 911, reports Philly.com. Instead, others said it should be a group decision. The 911 call wasn't made until the next morning. A text from one frat member to the other on the day Piazza was hospitalized apparently indicated they knew they were in trouble: "It's not the fact that he drank. He drank because we hazed him too. Main word being hazed," Philly.com reports. Other texts alluded to alleged covering up of evidence: "Make sure the pledges clean the basement, and get rid of any evidence of alcohol," one read. "Make sure the pledges keep quiet about last night and this situation," a text from another frat member read. Piazza's family told "CBS This Morning" last month his death was "murder" and "torture." "This wasn't boys being boys," father Jim Piazza told CBS News correspondent Jericka Duncan. "This was murder of our son. They tortured him for 12 hours. They let him suffer for 12 hours. He died a slow and painful death at the hands of these 'men of principal,' as they call it." Eighteen members of the fraternity face charges; two previously waived the preliminary hearing. Some of the members of the now-shuttered Beta Theta Pi fraternity are accused of involuntary manslaughter and aggravated assault, while others face less serious allegations. Penn State has permanently banned the fraternity, saying the school found "a persistent pattern" of excess drinking, drug use and hazing, and the fraternity's national organization disbanded the chapter. Last month a spokesperson for the fraternity told "CBS This Morning": "As these hearings begin, Beta Theta Pi International Fraternity has confidence in the judicial system that due process and justice can and will be served. We will continue to cooperate with authorities in all manners to make sure of it."